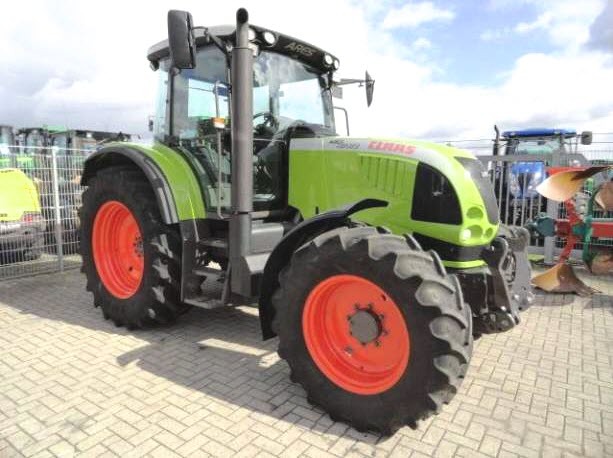 The tractor family from claas ares is a modern, powerful, comfortable and economical device designed to perform a wide range of jobs for agricultural purposes, towing and hauling varied cargo. Machinery efficient off-road, has a high permeability, maneuverability and is characterized by ease of management. Reliable automatic controls of the tractor claas ares almost independently, allowing the tractor driver to focus on getting the job done with maximum precision by controlling the efficiency of the equipment. Increased comfort in the workplace. Tractor popular brand is a guarantee of high quality, reliability and simplicity of maintenance, possibility of performing the most complex types of work in agriculture. All manufactured by machinery is divided into four categories – heavy duty tractor, heavy machine in standard, middle class and series Arion. effective, well thought out chassis design. Traction capability of the equipment has expanded the use of special articulated frame increased strength. The machinery has two leading and steering axles for better maneuverability. The minimum turning radius, depending on the type of installed tires can be up to 6 meters. In the design model there are many systems designed to improve the technical characteristics and parameters of emergency vehicles, first of all — parallel motion, Claas GPS Pilot other. Of impressive specifications and design features of the models in this group, we can note four-wheel drive transmission and a continuously variable transmission. The machinery has a capacity of more than 13.5 tons and can accelerate on the road to 50 km/h. Weight – 17 ton 230 kg. In the design of these tractors founded optimal, uniform distribution of the mass of equipment on the wheelset. The model is equipped with a powerful six cylinder engine (mark – FPT). Depending on the specific model of the power plant are minimal – 189, the maximum 410 HP to an Impressive value wheel base provides the necessary stability, controllability, and allows you to use the technique in almost all kinds of agricultural works. The “highlight” of the model range – convenient and highly-simplified shifting. And the onboard computer allows you to use a variety of settings and provides the most extensive functionality. In addition, the adjusted optimal torque is automatically regulated by fuel consumption, which improves the efficiency of operation of heavy machines. The tractor can also fast enough to move on the roads (max speed 40 — 50 km/h). And has a lot more than 13 tons. Series ARION claas ares presented several tractors with advanced features. Model 500-I and 600-I is a special equipment with sufficiently powerful engines (112 – 155 HP). Efficiency, excellent traction, payload, and maneuverability are the main advantages of models. If the tractor you plan to run the most complex jobs, with increased constant load – this option can be considered optimal. The middle class tractor claas ares in the best way characterize the most pronounced representative: Arion 640 C. long wheelbase is a successful constructive solution, which allowed to significantly increase the traction, and the system of uniform distribution of weight on all wheels ensures maximum throughput, which is most clearly seen in difficult terrain and difficult terrain. The cabin is equipped with air conditioning, as well as additional glass hatch. This provides increased comfort for the driver. All of these reasons, and also other tractor models fully meet the requirements for this category of special equipment requirements. Claas are among the world’s best equipment, which allows to widely use it in the construction sector and agriculture.